Established in 2006, Sapthip Co., Ltd., a subsidiary of Sapsathaporn Co., Ltd., produces ethanol for blending with gasoline. This gasoline blend, known as gasohol, is considered a renewable energy source because the ethanol is produced from cassava, a plant that is also grown as a staple agricultural product. With its production of this renewable fuel, Sapthip is supporting the Thai government's policy of reducing the country's dependence on imported fuel. The company has been licensed by Thailand's Ministry of Energy, Committee on Renewable Energy and Energy Conservation to produce fuel-grade ethanol (99.5%). Sapthip currently produces 200,000 liters of ethanol per day, for an annual total of 66 million liters. The company's goal is to become Thailand's leading producer of ethanol by improving the efficiency and reliability of its operations. In so doing, it aims to protect the environment and promote sustainability under a policy of "Creating sustainable energy for Thailand and protecting the environment." Construction of Sapthip's ethanol plant began in 2006. PRAJ, an Indian engineering firm, built the plant and licensed its process technology to Sapthip. 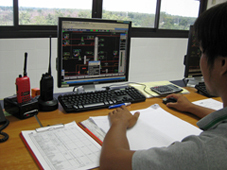 Yokogawa Thailand installed a CENTUM CS 3000 distributed control system to control the ethanol plant. Since the completion of this project in 2009, the installed systems have operated as designed, with no major problems. Under the terms of an annual maintenance contract, Yokogawa Thailand provides ongoing maintenance services to keep the production control system in good working order. 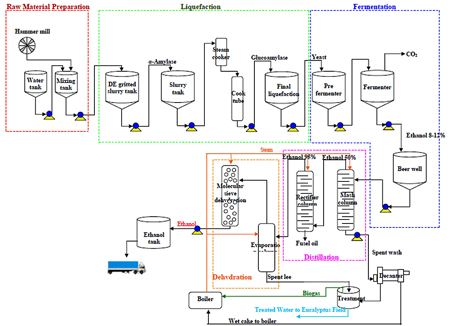 The production of ethanol from dried cassava chips involves a sequence of batch processes that require careful automated control for maximum efficiency and product quality. Rocks and other foreign objects like twigs and leaves must be removed from the dried chips before the chips can be ground into flour. The starch in the flour is then dissolved into dextrins by a liquefying enzyme, and a saccharifying enzyme is subsequently added to convert the dextrin into glucose. This is fermented with the addition of yeast to produce a mash with a 10-12% ethanol content. Through a distillation process, the alcohol is then separated from the water and other non-fermentable materials, resulting in a hydrous alcohol with a 95- 96% concentration that can be used as a fuel in specially designed flexible-fuel vehicles. To convert this into an anhydrous alcohol with a 99.5% concentration that can be used in standard vehicles, the residual water must be removed by a molecular sieve dehydration process that involves the repetition of an absorption and regeneration cycle every 8-10 minutes. With its sequence control function, the CENTUM system carefully controls all of these processes, including the feeding of materials and the execution of temperature profiling during fermentation. The condition and status of each process can be closely monitored in real time and accurately controlled by operators at the CENTUM CS 3000 human machine interface stations. The quality of the final ethanol product is very important. All of the ethanol produced by Sapthip is utilized in Thailand's domestic market. The final ethanol product is blended with conventional gasoline and can be used as is in engines. That's why the purity of the ethanol is very important. 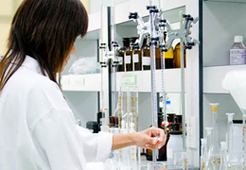 Every day, the technical division of Sapthip analyzes the product quality based on the data from the production control system, operator notes, and laboratory data. Suthamma Yoosin, manager of Sapthip's technical division, comments as follows: "We always have enough cassava in our storehouse to keep us producing fuel-grade ethanol 24/7 for an entire year. But cassava prices continue to rise, and so does the need to improve production yield. We are always striving to improve our operation and also minimize energy consumption. At the same time, we take great care to protect the environment by treating the plant's waste water and decreasing the amount of CO2, NOx, and SOx that comes out of the plant's smokestack. 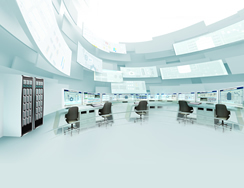 For these reasons, we are very comfortable with using Yokogawa's CENTUM CS 3000, and are pleased with its reliability, ease of use, and easy engineering."